I thought I'd share the results of my application for individual health coverage. Although I am actually healthy (not taking any prescription drugs, a recent echo stress test says my heart is looking good, latest blood pressure reading at the doctor's was favorable, and was merely opting for the catastrophic high deductible coverage as insurance against the unknown risks), my application was denied. I recently had minor "chalazions in the right eyelid" and they were removed in the doctor's office. It's basically acne and I could have easily covered the cost even without health insurance. I put this treated condition on my application in the name of full disclosure. The person who scored my application for risk apparently did not know what chalazions are and opted to call it glaucoma instead (which is a VERY serious health condition). Unbelievable! Needless to say, I'm appealing the decision. If I am dealing with a company (any company) then I pretty much expect for mistakes to be made at every step of the process these days (been dealing with Comcast a lot lately, which is no doubt "helping" the trend). Further, I absolutely cringe every time I think of my girlfriend being fired for simply doing what her boss told her to do (having her log in as someone else because he was too lazy to get her a login and password in a timely manner). Has incompetence become a national epidemic? Incompetence is a national epidemic. Kids leave high school not knowing how to spell, C-level executives think they can supercede macroeconomic laws, government executives practically sell incompetence wholesale. We seem to have a glut of C-level executives trying to supercede macroeconomic laws these days (especially in finance if the government bailouts are any indicator). Meanwhile, the government executives are doing more than "practically" selling incompetence wholesale. Without even looking at government inefficiencies, incompetence and lack of accountability, any time you dispense something for “free,” you’ll always dispense more of it. How can one possibly argue with that logic? Perhaps I'm an easy sell. I think "free lunches" tend to be the most expensive and "sure things" are often the most risky (Madoff!). As some of you might be aware, our pet bird has been having seizures and she was looking like she was on death's door. She wasn't eating. We were having to give her pain medication (and other medications too). This morning she got a CAT scan (amazing how much cheaper it apparently is to have it done for a pet bird as opposed to an actual child, although I have yet to see the bill). The results are in. They can't find anything life threatening. There are no tumors. Her heart, arteries, and lungs look like they are in great shape. About all they could find of interest was an enlarged esophagus and they are consulting with other vets to see if that might have anything to do with her problems. Overall though, we're all feeling pretty good today. The vets were pleased with the results. The worst fears have been ruled out for the most part. The bird is home and eating eating well. She also seems perky (which is pretty impressive since she was actually knocked out earlier today in order to run the tests). Hurray! It hit 106 degrees at our house today. I'm sitting in a handbasket as there is genuine concern that our economy has reached its final destination. I'm also testing the "snowball's chance in..." theory. We were told deflation wouldn't happen here. Six years later we got deflation on a massive scale. We are now told stagflation won't happen here. What are we going to be getting in six more years? That's just a silly question of course. I always have complete confidence in the Fed. "In the long run, higher energy prices are likely to reduce somewhat the productive capacity of the U.S. economy," Bernanke said. "Under the assumption that energy prices do not move sharply higher from their already high levels, these long-run effects, though clearly negative, appear to be manageable." So what if energy prices nearly doubled from their "already high levels" only to crash hard along with housing prices and everything else. So what if energy prices are almost back to those "already high levels" while unemployment is now a whopping 9.5% and rising. Assuming I get properly trained in its use, this anonymous blogger will no doubt be able to get a high paying job as an anonymous security officer if the you know what really meets up with the fan. How cool is that? You can take questionable advice from a phaser toting anonymous blogger for free, or you can shell out the big bucks for this, this, or this wearing professional business suits. Tough call! Did I mention that I shave once a week or so whether I need it or not? Hey, at least I bathe daily. It's so hard to compete. They charge just for their advice. Fee-only planners may charge a flat fee, a percentage of your investments - usually 1 percent - under their management or hourly rates starting at about $120 an hour. Still, you can generally expect to pay $1,500 to $5,000 in the first year, when you will receive a written financial plan, plus $750 to $2,500 for ongoing advice in subsequent years. Damn. I really need to charge something apparently. 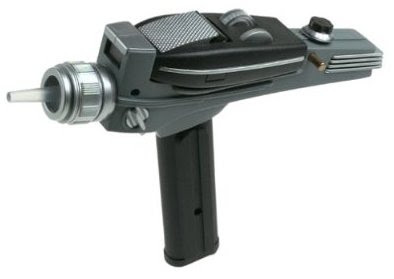 Just think of the hand phasers I could hoard if I charged just 1% of the standard starting hourly rate ($1.20 an hour). Here's a sampling of the advice you could receive from my premium service. Why the f**k are you spending THAT much money on financial advice? Over the course of 70 years, a 1% annual fee would see more than half of your entire nest egg gone (0.99^70 = 0.495). At $1.20 an hour, I figure that's worth at least a penny. It didn't take me anywhere near the full hour to think it up. It was more like instinct. It just sort of came to me in a vision. Hahaha! Picture retirement. There you are on your luxury yacht in the Bahamas. Your financial advisor sails up to you in the very same boat you have. You laugh. Looks like we did pretty well for ourselves you say. He replies, "Yep, I did just as well as you did. I really should thank you. You were my only client!" And lastly, let's revisit this security job idea again. Based on where I see the economy headed I would think that security jobs would become more plentiful. Let's see if that theory holds weight. Employment of security guards is expected to grow by 17 percent between 2006 and 2016, which is faster than the average for all occupations. This occupation will have a very large number of new jobs arise, about 175,000 over the projections decade. Concern about crime, vandalism, and terrorism continues to increase the need for security. Demand for guards also will grow as private security firms increasingly perform duties—such as providing security at public events and in residential neighborhoods—that were formerly handled by police officers. Wow. Amazingly blunt, isn't it? I was at the Department of Licensing today and thought I'd share my latest round of doom and gloom. It's a three part anecdotal evidence story. I overheard exactly three conversations pertaining to money. 1. The guy in front of me was a dollar short. I gave him a dollar. I almost always do this not so much for the other guy but for me. I told him it would improve my karma. In fact, I can even prove it. It cost me a dollar to feel pretty good. I may be miserly, but that's a good return on investment! Everyone should try it. I'm serious. 2. As I was sitting there waiting for my number to come up, I overheard part of another conversation. An employee said, and I quote from memory, "...that doesn't mean he has money. I have two Mercedes but I don't have any money." 3. The woman sitting next to me was on her cell phone. She was saying that she doesn't have $15 to pay the fee and that she wasn't quite sure what she was going to do. There's one dollar karma and then there's fifteen dollar karma. Sigh. Further, it would have been rude to admit I overheard what she said. Right? Care to ask me how confident I am that our economy will soon robustly rebound? A rich philanthropist could make a killing at the DOL it seems. I may not be rich, but I was given two opportunities in just 40 minutes. I've often heckled Ben Stein here but this week he's offering what I would call some rather decent advice to us as individuals. Unfortunately, I have commented that if every American started spending as miserly as I do then our country would be in even worse shape (as I very rarely visit any of this country's malls). I had never heard of the "funemployment" term until now. Now, let me be clear. Some people are simply not looking the reality of the situation in the face. There are some who, as my pal Frank Mottek from CBS describes them, are part of the "funemployed." This would be the young woman I know, funemployed, with an immense monthly expense tab, just out of grad school, who used many of her borrowings for a vacation in Europe. Another simply had to spend time touring the fashion capitals of the continent -- on borrowed money. And there are many more. Their turn to pay the piper is coming, and when it does there will be wailing and gnashing of teeth. Ernest Hemingway once quoted a friend on how he went broke: "Gradually, and then suddenly." Myth of the dollar. The world is stuck trading and saving in US dollars and the US is therefore able to run any size trade deficit. Any attempt to leave the dollar would result in foreign reserves of dollars becoming worthless and prevent global trade. Myth of cornucopia. America is well endowed with natural resources and any resource that runs out can be substituted easily. Myth of the military. Spending more on the military then the rest of the world combined means we can successfully fight our way out of any problem. Myth of the market. Market forces will address all of our needs. Myth of Eutopia. Americans are competent and our country well run. Though the last decade went very poorly, belief in the myths prevents concern. I believe in the "American Arrogance" theory with every fiber of my being. If nothing else, it has allowed TWO stock market crashes AND Ben Bernanke's "there is no housing bubble to go bust" to actually go bust in just one decade's time. I don't blame the government, Wall Street, or the media though. They are just reflections of all of us. Further, the arrogance in the following article by Paul Krugman makes me want to vomit. In my very humble opinion, the jury is still out on the taking on more debt to solve the debt crisis and save the world theory. It's a bit like ACCELERATING out of danger on an icy mountain road and then bragging about how we avoided the accident. If one must brag, at least wait until the car is under control and we're back to normal driving again. Further, I turned bearish in 2004 as I tended to believe the exact opposite theory. Borrowing a recovery doesn't work for the country any better than it works for an individual. I'm reminded of the $5,000 loan offer I got in the mail yesterday. Here's some ideas they offer on how I can spend the money. I can pay for car repairs. I can cover emergency medical bills. I need a minimum income of just $20,000 to qualify and no bankruptcy filings in the last 12 months. If I need more money they've got that covered too. I just need to let them know and they'll work with me to get the money I need. No joke. There's not one mention of the interest rate I'd be paying though (not even in the fine print). Taking out loans to pay for car maintenance doesn't sound like the best of long-term plans. Works great in the short-term though. I have this sinking suspicion the exact same thing will someday be said of deficits saving the world. Just an opinion of course. This arrogance post was inspired by a heckle left for me on a (nearly) dead thread. I finally got around to reconciling my expenses/budget for June today and see that some of my I-Bonds are now finally experiencing the full effects of the economy's deflation. I've been buying I-Bonds since 2000 and I thought I'd share how the ones I bought in December of 2003 are doing (as of June). It's been exactly 5 1/2 years. There's some good news and there's some bad news as it pertains to my personal savings (and not the economy in general). 1. The I-Bonds offered a rate of just 1.1% over inflation. It was not one of my better I-Bond purchases. That's bad news. 2. They are up 26% (4.3% average annual rate over the last 5 1/2 years) compared to the DJIA's roughly 20% decline. That's good news. 3. For the next six months they'll be paying 0.0% interest. That's bad news. 4. Deflation set in over the last six months and there is a lag. The I-Bonds are now behaving just like buried cash behaved. That's good news. Overall, the good news well overshadows the bad news. I rode the inflation wave up but I'm not required to ride the deflation wave back down. That combined with the ability to defer taxation makes I-Bonds my favorite "safer" investment of the past decade. In hindsight, 1.1% over inflation with serious deflation protection wasn't all that bad of a plan. I certainly did not predict a rapid rising inflation rate with a hard deflationary crash in 2003. I had more of a stagflationary mindset (and I still do long-term although I only lean that way). Buried cash is a fool's game long-term (at least as long as I-Bonds are offered). That's my opinion and I'm permanently sticking to it. This is not investment advice though, especially now that the I-Bonds offered today pay just 0.1% over inflation. On the one hand, they are virtually guaranteed to lose money over the long haul after taxes. On the other hand, they are still guaranteed to do at least as well as buried cash (and probably a lot better if there are periods of future inflation at all, even if we continue to toggle between inflation and deflation). And lastly, I-Bonds are one of the most liquid investments known today. I can cash them out anytime I like and I know the exact price I'll be getting. I'm in no great hurry to cash them out though. The jury is still out on buried rocks (gold and silver) vs. buried cash. I have no idea which is the better bargain right now. In 2004, I leaned toward the former. I'm not so convinced right now. Modern mining equipment is nearly as impressive as modern monetary printing equipment (especially if we can't get out of our deflationary and overcapacity deleveraging spiral). As an investor, both scare the heck out of me long-term. Sigh. Some financial "experts" say buy and hold is dead. I do not agree. It might be tempting to cash out these 2003 I-Bonds over the next six months now that they pay just 0.0% interest overall. However, I intend to hold the full 30 years (cashing them out in 2033). I'm concerned what might happen next. Since the government only allows me to buy so many I-Bonds in a given year, there's no way I can buy them back if I change my mind (if inflation does pick back up and these 2003 I-Bonds resume paying decent tax deferred interest again).